Read the prompt carefully, so you can see what you are supposed to do. After reading the example prompt below, return here to read the words which appear in red. The example prompt shows how complicated a prompt can be. Clearly, you need to read the provided speeches and look at the artwork in Figure 1. Then, since the word "OR" is used, you need to write about only one speech and the piece of artwork. Everything you write must be used as evidence to support why you have chosen your selected character as the character most responsible for Ophelia's death. The artwork shows one end result of the action in the play: Ophelia dying. Since art carries emotion, you should refer to the artwork, as well as to the play, when you comment on the emotional impact of the play. The play and the artwork demonstrate the tragedy that occurs. Use the words in the prompt to create your thesis statement. You must use words from the prompt to create your thesis statement. You must state the author of the play, the title of the play, the name of the artist, the artwork's title, the character you believe is most responsible for Ophelia's death, and three main reasons for your belief. Before you begin writing, carefully read the two speeches to decide which speech you understand better and which one gives the most evidence to support your belief that the character you choose is most responsible for Ophelia's death. Underline or highlight evidence as you read. Then write your thesis statement. Be sure to use the evidence you highlight and write formally. Do not use "I" or "you" in your thesis or in your essay. Example thesis: After reading Shakespeare's Hamlet and viewing Sir John Everett Millais' Ophelia, it is clear that Hamlet is the character most responsible for Ophelia's death because he tells her to go away, cares only about himself, and believes people have no control over their lives. Example Writing Prompt: Read the following speeches from Shakespeare’s Hamlet, delivered by Polonius in Act II and Hamlet in Act III. Then, study the piece of artwork labeled Figure 1. Using EITHER Polonius' speech OR Hamlet's, indicate which character in the play you believe is most responsible for Ophelia's death. Additionally, incorporate an analysis of Figure 1 and its relation to your insights about the play. Make sure that you utilize citations from Polonius' OR Hamlet's speech to structure your well-written essay AND utilize references to Figure 1 to explicate your position. And meant to wreck thee; but, beshrew my jealousy! Begin with an attention-getting sentence (one with a metaphor, simile, or imagery) or a question. Whichever approach you choose should lead the reader to your thesis. Then write one or more general statements about the play and the work of art. End your introductory paragraph with the thesis statement you wrote in Step Two. Shakespeare's Ophelia is a character with morbid beauty. Which character in Shakespeare's Hamlet is most responsible for Ophelia's death? Shakespeare's Ophelia is a character with morbid beauty. Words in Shakespeare's text and paintings like the one created by Sir John Everett Millais show a young woman who moves from hope to despair. Ophelia loves her father and her boyfriend, but they both betray her. Neither man sees her as a whole person; both see her only as a tool to be used. After reading Shakespeare's Hamlet and viewing Sir John Everett Millais' Ophelia, it is clear that Hamlet is the character most responsible for Ophelia's death because he tells her to go away, cares only about himself, and believes people have no control over their lives. Who is the character most responsible for Ophelia's death? Shakespeare's play Hamlet and Sir John Everett Millais' painting Ophelia both show a young woman who moves from hope to despair. Ophelia loves her father and her boyfriend, but they both betray her. Neither man sees her as a whole person; both see her only as a tool to be used. After reading Shakespeare's Hamlet and viewing Sir John Everett Millais' Ophelia, it is clear that Hamlet is the character most responsible for Ophelia's death because he tells her to go away, cares only about himself, and believes people have no control over their lives. Write your first body paragraph by providing evidence for the first reason you listed in your thesis statement. The first reason which makes it clear that Hamlet is the character most responsible for Ophelia's death is that he makes her miserable by rudely sending her away. In Act III, scene i, Hamlet tells Ophelia to, "Get thee to a nunnery…." Obviously, if a young woman is so thoughtlessly rejected by her boyfriend, she is going to be very upset. Millais' painting shows a woman who is dressed in clothes that make her seem likely to have a wealthy and a happy future, but the artist shows the weight of those clothes pulling her under water to her death. Shakespeare lets readers feel the weight of Hamlet's words on Ophelia. When he sends her away, she has nowhere to go. Write your second body paragraph by providing evidence for the second reason you listed in your thesis statement. The second reason which shows Hamlet's responsibility for Ophelia's death is that he cares more about himself than about anyone else. In Act III, scene i, in just a few lines, he uses the word "I" five times. He says he is "very proud, revengeful, [and] ambitious…." Millais' painting shows the results of Hamlet's neglect of Ophelia's feelings. With no one to care about her, Ophelia seeks to escape her loneliness by dying. Certainly, Hamlet cares more about his own needs and feelings than he does about Ophelia's. Write your third body paragraph by providing evidence for the second reason you listed in your thesis statement. The third reason which demonstrates Hamlet's responsibility for Ophelia's death is that he believes no one has any control over their lives. In Act III, scene i, Hamlet says that he is someone "crawling between earth and heaven…." His words do not show an upright man making choices, but instead show a man crawling helplessly, reaching towards heaven, but unable to get there. Millais' painting shows Ophelia trying to reach heaven. Like Hamlet, she is not upright; she is lying flat on the water with her hands lifted up towards the sky. Hamlet tries to avoid responsibility for the choices he makes in life by comparing himself to something crawling. Some readers might think he makes a good comparison because his behavior towards Ophelia is more like a snake or a worm than like a caring boyfriend. Write your conclusion by referring back to your thesis, summarizing your main points, and stating what readers and viewers can learn by reading the text and viewing the artwork. 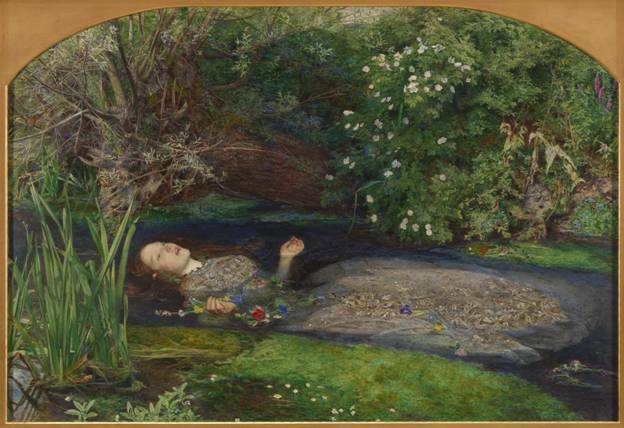 Shakespeare's Hamlet and Sir John Everett Millais' Ophelia show that Hamlet is the character most responsible for Ophelia's death. The playwright and the artist reveal that Ophelia dies because Hamlet rejects her, cares about his feelings instead of hers, and tells her that people are doomed to crawl hopelessly about on earth. Both the play and the painting demonstrate that people need support to survive in a harsh world. Since Ophelia has no support on earth, she tries to reach heaven by drowning herself. Hamlet has taught her that she has no other choice. Read what you have written. Be sure you have explicated (explained) your point of view and have provided evidence in each body paragraph from the text and the piece of art. Be sure you have not used the words "I" or "you" unless you quoted those words from the text.